The Ancient Roman Empire was a military empire and therefore battles and wars were an essential feature of ancient Rome. The real battles of ancient Rome started soon after the establishment of the Roman Republic, although initially the battles were in the form of small scale clashes, and intensified with the passage of time. Also, with the passage of time, ancient Romans considerably improved their battle tactics which usually gave them an edge over their opponents. Many of the wars and fights in Rome played the most important parts in helping to expand this small city state into an empire that stretched over three continents. 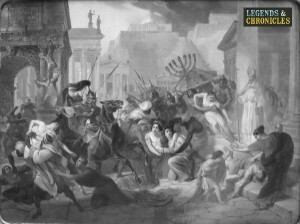 The history of Roman battles can be traced back to 498 BC when Romans defeated the Latins and established their power in the Italian Peninsula. From this point onwards, Romans were constantly engaged in small scale clashes or large scale battles with various other empires and city states. The actual Roman expansion, however, is thought to have been triggered in 396 BC when the Romans besieged and captured Veii, an important Etruscan city. But the expansion was not smooth and Romans had to face various setbacks along with way, such as the sack of Rome by the Gauls in 387 BC and the invasion of Italy by the famous Carthaginian general Hannibal in 218 BC. Ancient Romans excelled themselves in efficient tactics and formations that they used in the the many battles they fought in. Various war manuals and accounts of battles exist that show the efficiency of Roman battle formations and tactics. In normal circumstances, Romans placed the infantry in the centre with cavalry on the wings. Various names were given to different kinds of formations and tactics during the many battles the Romans were involved in. For instance, the wedge was a formation where legionaries formed a triangle with the tip of the triangle pointing at the enemy. This enabled small groups to be thrust well into the enemy lines. Other notable formations included the saw formation, the tortoise, the orb, and others. One of the many battles of ancient Rome, was the battle at the Milvian Bridge. One of the most famous battles of ancient Rome was the Battle of Cannae in 216 BC which was also the most important battle of the Second Punic War. Rome faced a terrible defeat in this battle against the famous Carthaginian general, Hannibal. The army of the Roman Republic was being led by consuls Lucius Aemilius and Gaius Terentius Varro. 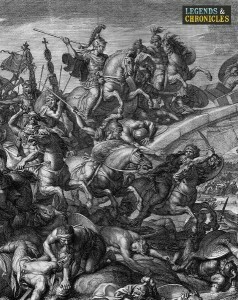 The battle is particularly famous for the military and tactical genius of Hannibal. Even though Romans had a clear edge over Hannibal in terms of heavy infantry, the double-development tactic of Hannibal turned the tables on the Romans. The Battle of Silver River in 71 BC was another famous battle of ancient Rome. This was among the series of battles fought against Rome by the rebel slaves under the leadership of the famous gladiator Spartacus. Together with other battles of the series, this was known as the Third Servile War fought between 73 BC and 71 BC when the rebellion was finally crushed. This particular war was fought by Rome under the leadership of Marcus Licinius Crassus and after suffering many casualties, the Romans managed to kill Spartacus and to win the battle. One of the most important battles in ancient Roman history was the Battle of Actium which resulted in Ptolemaic Egypt becoming a Roman province. The battle was fought between the army of Octavian and the combined forces of Mark Antony and the Egyptian Queen Cleopatra on September 2, 31 BC. The Battle also proved highly advantageous for Octavian who assumed the title of Princeps meaning ‘first citizen’ and was additionally given the title of Augustus by the Senate following the battle. On the other hand, Mark Antony committed suicide and upon hearing this news, Cleopatra also killed herself. Ancient Rome was essentially a military empire and many of the wars of Rome were fought under the leadership of exceptionally able generals which we will detail more below. A depiction of the sacking of Rome, one of the most important battles of this civilisation. One of the most famous generals of ancient Rome was Lucius Quinctius Cincinnatus who was also a statesman and an aristocrat. He was regarded as a Roman hero by the aristocratic Roman class and an example of high Roman virtue. Under his leadership during battles of ancient Rome, Rome defeated various rival tribes such as Volscians, Sabines, and Aequians. After performing his service for Rome, he resigned and led the rest of his life in peace and quiet. Publius Conrnelius Scipio, also known as Scipio the African, was a Roman statesman and a general during the Second Punic War. His most famous accomplishment was the defeat of the seemingly undefeatable Carthaginian general Hannibal at Zama. This glory earned him the title of ‘Roman Hannibal’ and he came to be recognised as one of the greatest generals in the history of ancient Rome. A famous quality of Scipio was his humane treatment of the prisoners of war. Once, when presented a beautiful woman as a prize for his victory in war, he returned her to her fiancée who was a Celtiberian chieftain known as Allucius. Allucius, as a gesture of respect, gave him some of the warriors of his tribe to fight for him. The famous ancient Roman general who was responsible for defeating the once mighty Kingdom of Macedon was Lucius Aemilius Paullus Macedonicus. This happened during the Third Macedonian War and in particular in the Battle of Pydna fought in 168 BC. This battle also resulted in the end of the Antigonid Dynasty of Greece. He was also a Roman Consul who served two terms. His father, too, was a consul named Lucius Aemilius Paullus who was defeated and killed in the famous Battle of Cannae against Hannibal. Ancient Rome was a military empire which continued to expand through military conquests of other city states and later on other kingdoms and empires. Throughout the many centuries of ancient Rome, many famous battles were fought in which Rome did not always emerge as the victor. Ancient Rome developed a very strong army and very efficient military tactics which gave it an edge over its enemies. Various famous generals led the military of ancient Rome and earned glory through their victories.